Dear Leader to Retire in 2015? North Savannah News Service announced yesterday that Dear Leader plans to retire and to relinquish her matronly grip on SCAD in 2015. The Savannah College of Art and Design, an art school that she, her husband, her parents, and her smarter, nicer sister founded in 1979, rose last year to the distinguished rank 1,248 in student return on investment. Dear Leader is expected to pass her Bee Baton to her much beloved, and deeply touched son, Dear Tik. News of Dear Leader’s retirement was met with gut wrenching wails (and a generous gnashing of teeth) by the SCAD hive of faculty and staff. SCAD’s supreme stubby queen announced her two year ‘transformation’ from world’s most impressive arts educator to that of budding socialite, a role for which she was born to play. 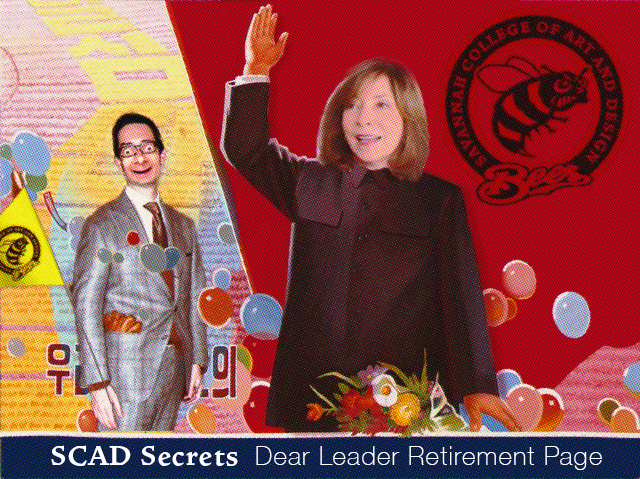 North Savannah, December 18 (SCAD Radio) — The Mad Turk, SCAD’s Marshal of Faculty Engagement) is deeply saddened on the occasion of the upcoming possible retirement, assuming nothing goes wrong and she really means it this time, of Dear Leader. “Even now, in the streets and alleys of Savannah, SCAD faculty voices are reflecting public mindset—praising the history of the sun. As proof of Dear Leader’s impact, South Georgian media have devoted much space to conveying her greatness for the past 35 years, carrying the portrait of her with a broad smile on her face through the empty streets, shrimp shacks and low country blues joints. Posted on the many and much visited websites of south Georgia are articles titled “There is no such great leader in the world as General Dear Leader, who devoted herself to the school and to well designed porches all her life”, “Feats performed by Dear Leader for the SCAD nation will shine long” and “The noble soul of Chairwomen of the National Porch Commission: Dear Leader—the sun of the nation, will always be cherished in the hearts of fellow SCAD faculty. Songs praising Dear Leader have been widely disseminated among south Georgians. These facts help us to appreciate their reverence for her. South Georgians yearning for her fuels the ardent trust in feeble-minded Marshal Tik, her son and natural successor. The distinguished career of Dear Leader will be celebrated with song, clog dancing, rickshaw races, and apple bobbing. Dear Leader’s favorite restaurant, Longhorn Steak House, will cater all administration celebratory events. SCAD Secrets has created this special page dedicated to the festivities and events that will no doubt awe, inspire, as well as educate the SCAD community as we celebrate, with a heavy heart, the retirement of Dear Leader, the Queen of the South. SCAD Museum of Art Broke? Happy Holidays Dear Leader!